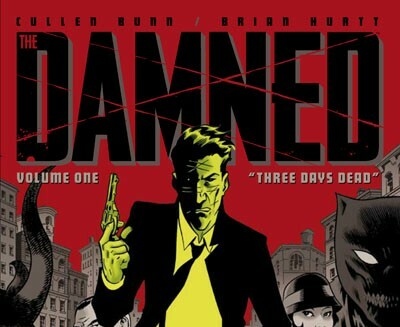 Showtime Developing Drama Series Based On Comic Book ‘The Damned’!!! The Showtime network has a new tv series project in the works and it is based on the Oni Press comic ‘The Damned’. It will be written by David Hayter, who co-wrote : X-Men, X2, and Watchmen. So that right there, has got me interested right off the bat. ‘The Damned’ comic was written by Cullen Bunn and illustrated by Brian Hurtt. The tv series adaptation will revolve around Eddie, a cursed man who is stuck in the middle of a turf war in modern-day Chicago where mobsters are demons. Eddie must play all the angles to keep the warring families at bay while trying to reclaim his soul. I’m glad that several networks are prepping comic book adaptations for tv series. Such as the ‘Powers’ tv series and of course the giant success ‘Walking Dead’. Looking forward to this. This entry was posted on Wednesday, August 24th, 2011 at 5:01 pm	and is filed under Comics, Film, News. You can follow any responses to this entry through the RSS 2.0 feed. You can skip to the end and leave a response. Pinging is currently not allowed. « THE STRANGE HISTORY OF DON’T ASK, DON’T TELL DEBUTS SEPT. 19 AT MIDNIGHT ON HBO, THE DAY THE LAW’S REPEAL GOES INTO EFFECT!! !